For those of you interested in solar-climate connections, I strongly recommend reading DamonLaut2004.pdf from which one may quote gems such as: Analysis of a number of published graphs that have played a major role in these debates and that have been claimed to support solar hypotheses [Laut, 2003; Damon and Peristykh, 1999, 2004] shows that the apparent strong correlations displayed on these graphs have been obtained by incorrect handling of the physical data. The graphs are still widely referred to in the literature,and their misleading character has not yet been generally recognized. Readers are cautioned against drawing any conclusions, based upon these graphs, concerning the possible wisdom or futility of reducing the emissions of man-made greenhouse gases. In particular the analysis of Eigil Friis-Christensen and Knud Lassen's 1991 Science paper is interesting. Thanks to Thomas Palm for pointing out the link, over on sci.env. Or at least, he is good for my visitor-count, which more than trebled to an all-time record of 300+ on friday after he mentioned my most excellent post on GW myths. And I got another $0.29 in google adsense fees, taking my total to a dizzying $1.63, only $98.27 from my first paycheque :-). TL also found this junk from Paul so I have another one to add to the myths: that heat pollution is a significant source of warming (this one isn't intrinsically silly, though the post by Paul certainly is: people did use to worry about it, till they realised it was small compared to CO2 effects). I thought 11 myths was fair going (#10 wasn't exactly carefully reasoned, though true) but still I forgot a few. Thanks to those who reminded me. I'm at my mothers house now with (horrors) only a dial up line and no wireless connections, so I'm a bit crippled for facts (who says greenies aren't in favour of technological advance?). But I'll post these myths here now, and probably do an update in a day or two with added facts - in the meantime, anyone who has a nice fact to fill in is welcome to comment. 1. Its all models Well obviously the measurements of the current temperature rise aren't (except the ones from the satellites, which do have to be passed through a model, ha ha, so its ironic that the same people who will argue "its all models" tend to prefer the satellite record...), nor are the observed rise in GHG's. But projections of future change inevitably come through models. But these models are themselves constrained by observations (match to the past century) and theory (basic radiative transfer; feedbacks; etc). This is obviously silly. It is true that science isn't done by consensus - but so what: no one is saying it is. But when you're thinking of science advice to policy making, you ought to follow the consensus/majority view. I've sort-of done this before. 3. All the scientists say the same thing because otherwise they will lose their jobs. This one fails to explain the existence of skeptics like Lomborg, Lindzen, Spencer or Svensmark. And it fails completely to understand the nature of scientific society. It isn't some kind of Sekret Kabal. Its an open process: if there are holes in a theory, you can make a name for yourself by pointing this out. I would say that consensus-busting papers stand more chance of being published (on an assumption of equal technical merit) than those supporting it: purely because of the requirement for novelty which journals impose. 5. CO2 saturates within 1m/10m. This one is fairly technical so not very popular as a myth, because it requires a bit to even understand it. The idea is that increasing CO2 won't matter, because the CO2 absorption regions are saturated anyway. Now this isn't one of my strong points (Josh?) but as I understand it this is why the radiative response to CO2 is linear (v low CO2 levels) to sqrt (moderate) and log (current levels). 6. There are not enough fossil fuels available to increase CO2 levels. This one is fairly rare and I'm not sure anyone really believes it. Oil might run out but I don't think there is any shortage of coal, tar sands and misc gunk to get us to at least four times pre-industrial CO2. I find it hard to believe that the future emissions scenario constructers failed to consider this point. 8. Its all hype to get funding. This one has a grain of truth to it. Agencies do tend to look favourably on proposals which are relevant to the real world. Amusingly, this is probably why a number of solar type folk have got interested in GW and are pushing the solar-GW connection: its good for funding. Which shows up the converse: of the skeptics, plenty have tenure; plenty of tenured people aren't skeptics. But if you want large funds and high salaries... you don't go into science to start with, or stay there. 9. CO2 lags temperature in cores. In facts its pretty hard to tell whether is does or not, because the CO2 comes from the air trapped in the bubbles but the temperature signal comes from the ice itself. And this leaves an uncertainty as to the age of the CO2 relative to the ice, because the pores in the ice only close off slowly - leaving uncertainties up to about 800 y in high cold cores like Vostok. And when you're plotting picture to play with the data yourself, its hard to know what adjustments have been made, so be careful. However, having said that, I think that what indications there are do tend to indicate temperature leading CO2. But: this is not terribly relevant. Trying to explain the last 800 kyr of ice ages, there is a puzzle as to the size of the forcing, which needs an amplifier to produce the size of response. CO2 feedback is one candidate. In which case, you would expect T to lead CO2. But in the case of current climate change, we know full well that the forcing is CO2, not temperature. 10. Fred Singer has anything useful to say about global warming. The traditional number 10: not one that many people believe. Did you know that of those listed on the board of advisers to SEPP, three are dead? Play a fun game: see if you can guess which they are (no cheating by looking at the wiki page). This post is about myths of global warming, but calling it that would be dull; it was going to be called Fables of the deconstruction but MotNF seemed better and perhaps more obscure. Partly, its a feeble attempt to gain wordshare by recycling some old posts, but there is some new stuff. To save time and space I haven't trawled for the evidence of people that believe these myths. 1. In the 70's, everyone was predicting an ice age: fairly common in disrespectable circles but comprehensively refuted by the excellent if over-long and byzantine http://www.wmconnolley.org.uk/sci/iceage/, and more comprehensibly by www.realclimate.org/index.php?p=94. Yes I know I mentioned this only recently (and JF picked up on it). 2. Its all the Urban Heat Island: no it isn't: see The Surface Temperature Record and the Urban Heat Island. In fact, recent evidence suggests less UHI that reported by the IPCC TAR. 3. The surface may be warming but satellites show the atmosphere is cooling: not true: depending on how you built the satellite record, it shows a warming of between 0.08 oC/decade and 0.26 oC/decade, from 1979 to 2004 (ish). See http://en.wikipedia.org/wiki/Satellite_temperature_measurements for the details. There is a kernel of truth to the myth: once upon a time (last in 1996) the satellite record did show cooling, but never as large as the warming it now shows. 4. The hockey stick is broken and therefore the current warming is not unusual: the MBH98 "hockey stick" graph was groundbreaking in its day, but there are now several other reconstructions: the best pic I know of is at http://en.wikipedia.org/wiki/Image:1000_Year_Temperature_Comparison.png. But... its by no means clear at the moment which (if any is correct); and all show the current temperatures and rate of rise to be unusual. Its also true that the hockey stick is not quite as important as the septics often like to claim: What If … the “Hockey Stick” Were Wrong? at RealClimate is interesting. 5. The current CO2 rise is natural, not man-made: this one is totally absurd. To believe this, you have to believe that CO2 and other GHG's were stable at pre-industrial concentrations for thousands of years, then suddenly, just as humans started emitting them, some natural process started emitting them, while at the same time removing from the atmosphere an equivalent quantity of the man-made GHGs (yes I know about the resident fraction...). This is the obvious argument; more complex ones from isotopic measurements can be made, e.g. at How do we know that recent CO2 increases are due to human activities? (update). BTW, notice I've used "man-made": I could have said "anthropogenic" but this is just man-made said in greek. 6. Climate is always changing. True, but so what? We care about the magnitude and speed of current and likely future changes; "climate is always changing at current rates" is definitely false; its all about timescales. See Why do people say... Climate change 'is the norm'? 7. Global warming will cause cooling! Or, the "Day after tomorrow" effect; or Thermohaline shutdown: people love this one because it appears paradoxical. The basic idea (twisted so badly by TDAT (as I understand it; I never watched the stupid movie) that its unrecognisable) is that GW will, by freshening the waters of the north atlantic, lead to a shutdown of the thermohaline circulation, a shutdown of the gulf stream, and therefore massive cooling over northern Europe. THC shutdowns have probably occurred in the past, as a result of freshwater discharges, but only while there are large ice sheets over north america. The Gulf Stream is not the same thing as the THC. And as far as can be told, the probability of a THC shutdown is not high: in fact, it doesn't happen "by itself" in coupled models runs, you have to force it to happen; what you get is instead a slight slowdown and although there is a cooling tendency from the slowdown, the overall effect is warming, even over northern europe. The TAR, section 9.3.4.3 Thermohaline circulation changes is good, as always. 8. The ozone hole and climate change. Not really a myth, just a confusion: the connections between ozone hole (or, better, ozone depletion) and GW is thin. They are: (a) ozone holes require very cold conditions; GW will warm the troposphere but (possibly confusingly) cool the stratosphere where the ozone is; hence, there will be a tendency for GW to cause more depletion. OTOH CFC levels are expected to decline. (b) ozone depletion represents a radiative forcing of the climate system, overall a net negative forcing: ie, it tends to cool the troposphere and surface (c) both GW and OD tend to cool the stratosphere; this cooling is observed but not as useful as it might be as a fingerprint of GW, because of the ozone changes. 9. The greenhouse effect keeps greenhouses warm: not so. 11. Uncertainty. Once the septics have run through about every other excuse they are down to pressing the virtues of uncertainty: that because we don't know in enough detail the effects and size of GW, we should do nothing yet. Of course they don't really mean "do nothing"; they mean "do nothing to reduce our emissions of GHG's". This seems to be the current position of the Bush govt: obliged to admit the reality of the current temperature rises, and even describing it as "sharply rising" (thus stomping on the std.septics, but they keep quiet about that), the POTUS continues... We do not know how much our climate could, or will change in the future. We do not know how fast change will occur, or even how some of our actions could impact it.. Well, this isn't really right: we do in fact know that emitting CO2 will warm the climate. But anyway, (as Michael Tobis has argued on sci.env better than I can, sadly I can't find it right now) uncertainty should make you feel unsafe, not be some sort of we-don't-know-its-ok cocoon. Well, thats enough myths for now. If I've forgotten some, I hope you'll let me know. I don't understand "still life" or "watch tv" (we don't have one!). Oh... and did I mention that my wife got through to the second round of the advanced III category EPTA piano competition, playing Rachmaninov Etudes Tableaux in F minor, G minor and C major? Well she did. Things seem to have gone a bit quiet. I haven't posted much recently (and my traffic has suffered... though I suppose it could be because people read via the excellent PlanetFleck, I do :-). RealClimate had quite a big gap from late Feb to early March (incidentally, the RC site counter has just gone over 200k). Though there have been some good ones recently (glaciers; CO2 lifetime; two reports from IPCC AR4 meetings): and Will spring 2005 be a bad one for Arctic ozone? was quite prescient since just this week we've measured ozone down to 230 DU in Cambridge. And sci.env has been pretty dull: there really isn't a lot of news recently. Kevin Mayfield manages to make two errors in one short letter (5 March, p 32). The second (confusing weather with climate) is commonplace. The first (believing that 30 years ago an ice age was predicted) is less common but just as wrong. See: www.realclimate.org/index.php?p=94 for a readable explanation or www.wmconnolley.org.uk/sci/iceage/ for more detail. but this is hardly a new thing. 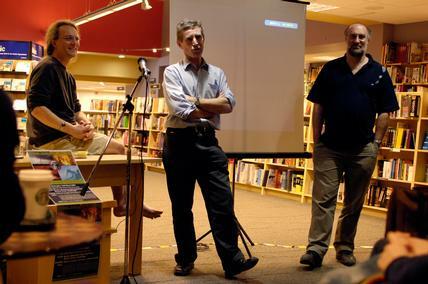 I posted that I was doing a talk at Cafe Scientifique on Wednesday 16th, and now I've done it, and the photo is the proof: me (left); Howard Griffiths (centre) and Pete Convey (right). Its at the question time, afterwards. So... how did it go, I hear you ask? Quite well, I reply. A decent audience (70+), I presented my stuff well (aided by having 20 mins, about twice as long as I was originally expecting) and so did the others with theirs. You can if you wish read my ppt presentation (or my sxi presentation, if you prefer :-) at http://www.wmconnolley.org.uk/sci/gw/ but I fear you may find it unilluminating without my voiceover. I was midly disappointed by the questions afterwards. Where have all the skeptics gone, for one thing. And perhaps a lack of deep knowledge for another (obviously you wouldn't expdct DK from everyone, but I would have hoped for a few). Perhaps everyone was quite convinced... Also the bios (somewhat to my surprise) were able to find plenty of examples of cl ch showing up in the biology, but nothing you could call bad, in and of itself. And afterwards to the Castle for some Oyster Stout with friends. Its spring, and the flowers are out, and once again I've neglected to dig my allotment thoroughly over the winter, and stuff like that. 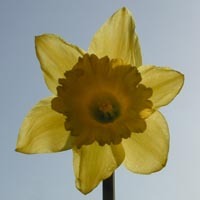 To celebrate, here is a picture of a daffodil with the sun behind it that I took on the rec today. There was a good sunset too, with hints of iridescence in the upper clouds. ie, what I did in february. I 'ad that Brian G come inta me office - looking shifty - I knows sumfink were up - sure 'nough, 'e sez to me (sorry, I'll give up the accent now) "would you like to be famous" (or words to that effect). Distaining the obvious "but I am already" I listened to what he had to say, which was an invitation to take up an invitation he had to appear at "Cafe Scientifique" (if you still see a poster for some cyborg stuff, its because they haven't updated it from last time...) which is part of the naked scientists. TNS's, manfully swallowing their disappointment at getting humble me rather than the somewhat more famous Brian, have nonetheless put a brave face on it, so if you're in Cambridge next wednesday evening (16th March, 8pm) then come along to Borders and listen (and contribute if you like) to a panel discussion on Climate Change. While I'm fighting the good fight over the various Global warming related articles on Wikipedia, Miriam has been taking another approach - wiki as soap opera. It started when she followed the RFC against me, and continued in the various edit wars. I keep urging her to get an account - it takes only a few seconds - and to start posting on, say, classical music; but no; she is a lurker. But wiki as a soap opera can provide you with hours of entertainment if you want, with the added thrill that at any time you feel like, you can participate. Soap opera is all about conflict of course, so a good place to start is Requests for arbitration. This is, as the page says, the end of the dispute resolution process, when all else has failed. One that I have an passing interest in is the case of 172, who I only know from his unwise protect of the GW page. Elsewhere he may be quite sensible, but he has certainly riled some people and it looks like his case will be accepted - ie considered for arbitration. See also the 3 reverts rule enforcement page for the full bizarre history - he ended up having a blocking war with other admins, only ended when Ed "capricious" Poor stepped in and de-sysop'ed them all. Ed gets away with lovable-but-stupid things like this because it all works out well in the end (so perhaps they aren't stupid...). I got an hours ban for sarcasm from him just recently (and M says I should have got another for this). Hmpf. The other case I've been interested in (indeed I started the RFA) is RFA:JonGwynne who (thank goodness) now appears to have gone away entirely, presumably since the case went so badly against him. Other places to look for exciting conflict on wiki are Requests for comment where people can list pages or people they think are bad, biased or in some way in need of comment from the wider community. Browsing that recently I picked Wave-particle_duality and made some notable improvements... I think... well check the history. Why don't you pick one on the list and go and help it out? Another way to follow strands is to pick a page - GW, or any page - and click on the "history" tag at the top, to find the list of contributors, then click on one of the users who has contributed to see their user page, then click on "user contributions" (probably in the "toolbox" in the sidebar to the left, though this can vary if you have a different "skin" selected) to see what else they have been up to. Miriam does this for the GW related pages to see if the people I am in conflict with to see if they have genuine and productive edit histories elsewhere. And if all else fails, you can look at the Recent changes list. The interesting question is, *why* does the stratosphere cool? From asking colleagues, its quite clear that very few people have thought about this, and of those few who do think about it few get the right answer. Indeed, I'm not absolutely sure that what I've written below *is* the right answer, but I think it is. For a long (and possibly doomed) attempt to explain it, see this at RealClimate. In the troposphere (ignoring convection etc etc; the real atmos is complex...) increasing CO2 increases both the ability to gain and lose heat, and this first-order argument doesn't tell you what will happen; as it turns out, it warms. Note: of course the fact that many people couldn't explain this makes no difference at all to the fact that climate models produce the correct answer: they just integrate the equations, and don't care about *why* things happen. [Update in response to comment: the troposhere is the lowest bit of the atmosphere - up to about 8km. Temperature generally decreases with height at about 7 oC/km. The stratosphere comes next, temperatures *increase* with height (the temp min defines the interface, called the tropopause) until the mid-strat, then declines again to - I think - the stratopause. See IPCC glossary for more. I've fiddled my formats a bit. The page is now wider (I couldn't work out how to auto-size it) and the font is smaller. And stuff. But I was guessing.